Flowserve is the world’s leader in the design and manufacture of corrosion resistant fluoropolymer lined valves. 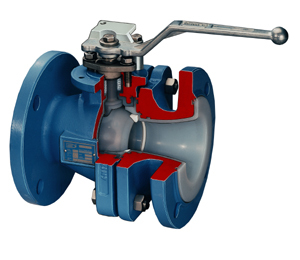 Flowserve Atomac valves provide bubble-tight shutoff, low maintenance, no-leak stem seals, and the safety assurance of a blowout-proof stem assembly. For performance, safety, and reliability, Atomac is the valve of choice. AKH3 has ANSI Body dimensions. Thick liner is 100% spark-tested with 20,000 V, made from highly corrosion-resistant FEP. A variety of metallic and non-metallic ball material options are available. Ductile iron body sections (ASTM A39560-40-18) with high strength B7 fasteners are both robust and rigid. B8 bolting is offered as alternate. Designed in accordance with ASME B16.5, Class 150 flange dimensions and ASME B16.10 face-to-face dimensions. Leak testing according to API598. Lining securely locked into the body by T slots and locking grooves; completely encapsulated ball and stem. PTFE chevron packing provides stem seal integrity while maintaining low turning torque.